Show Off Your “Egg-cellent” Foodtography Skills for a Chance to Win $5k! You are here: Home / SoCal City Kids News / Announcements / Show Off Your “Egg-cellent” Foodtography Skills for a Chance to Win $5k! Amateur food photographers rejoice! To celebrate 25 years of providing the only egg that provides better taste, better nutrition and better freshness, Eggland’s Best (EB) is searching for the most passionate EB fan, who also happens to have an eye for taking beautiful photos of their delicious & healthy Eggland’s Best dishes! 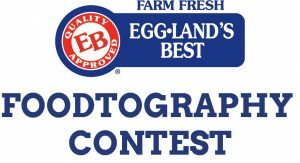 For the first time ever, EB is tapping into the “foodtography” trend and inviting fans to submit their best original “egg-cellant” food photos in one of four categories by April 12, 2017 for a chance to win $5,000 and a year’s supply of EB eggs! To enter (and for official rules), visit www.egglandsbest.com/foodtography and submit two mouthwatering photos of your favorite EB dishes. All dishes must include at least two whole Eggland’s Best eggs and can be entered into one of four categories: breakfast/brunch, appetizer, main course, or dessert. The five highest-scoring entries will be determined from each category for a chance to compete in the semi-finalist round where EB fans can vote to help select the finalist in each category. The finalists will then be revealed on the EB website where EB fans will once again have the chance to vote for the ultimate EB Foodtographer! Each finalist will be awarded $1,000 and a year supply of EB eggs, and the Grand Prize winner will receive $5,000 and a year supply of EB eggs! Eggland’s Best (EB) is the No. 1 branded egg in the U.S. and is an excellent source of Vitamins D, B12, and E, and a good source of Vitamin B5 and Riboflavin. EB eggs have five times more Vitamin D, more than double the Omega-3, 10 times more Vitamin E and 25 percent less saturated fat than ordinary eggs. Independent testing has also confirmed that Eggland’s Best eggs stay fresher longer than ordinary eggs. The distinctive “EB” stamp on the shell assures consumers and food service customers that the eggs meet the highest production and safety standards. Eggland’s Best was voted “America’s Most Trusted Egg Brand” by American shoppers in the 2016 BrandSpark Most Trusted Awards, “America’s Most Recommended™ Eggs” by women in the 2016 Women’s Choice Awards, and has received numerous awards from Prevention Magazine, Men’s Health, Men’s Fitness, Taste of Home, Women’s Health, and many others. In 2014, Eggland’s Best was also awarded “Product of the Year” in the egg category by Product of the Year USA. Eggland’s Best’s hens are fed a strictly controlled, proprietary, high-quality all-vegetarian diet, which results in a better tasting, more nutritious egg that stays fresher longer. EB eggs are available in large, extra-large, jumbo, cage free, organic, hard-cooked, cage free hard-cooked, liquid egg whites, and are certified Kosher. For more information, visit www.egglandsbest.com. Self Disclosure: I received free coupons to facilitate this post. Information was provided.